Your donations make this important project possible! Qayanek always welcomes donations. 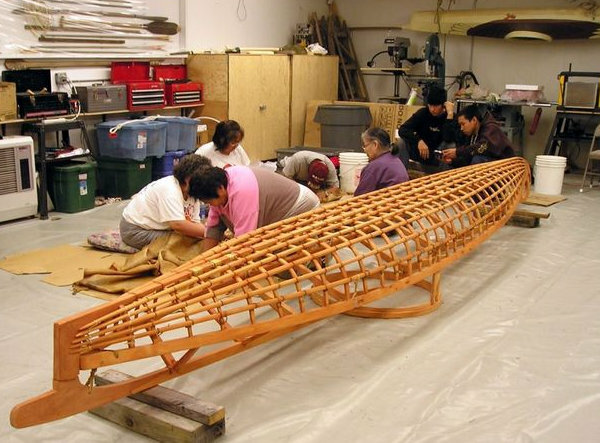 Especially, now with Qayanek’s efforts to build 10 contemporary Yup’ik kayaks. Qayanek is personally putting many thousands of dollars of in kind support into the effort.. When donations are given directly to Qayanek there is no paper work for you, and the donation is not tax deductible. Qayanek will pay taxes on the funds because the revenue is very needed to help cover the cost of labor for building so many kayaks. Donations have helped Qayanek to train local qayaq builders and save this amazing traditional knowledge. Qayanek is small, but it has become a world class traditional qayaq building center. The expense of keeping the center open with oil prices, electricity, and equipment and labor have been extreme. Oil, electricity, and maintenance for the past 10 years have always been covered privately by Bill & Mary Ann Wilkinson. (Mary is Frank and Nellie Andrew’s daughter, and one of our trained skin sewers) Anyone willing to help is more than welcome to mail a donation.